Prime Minister says a good deal would dismantled Iran's ability to prepare fissile material for a nuclear bomb; French president says France demands guarantees Iran will abandon nuclear weapons program. Israel will not be bound by a "bad agreement" with Iran, and when it says "never again," it means it, Prime Minister Binyamin Netanyahu said Sunday night at a press conference with French President Francois Hollande. 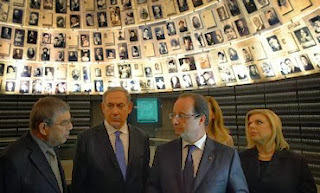 The press conference followed a visit Hollande, accompanied by Netanyahu, took to Yad Vashem, and Netanyahu evoked the Holocaust in explaining his thinking on Iran. "You said when you came out [of Yad Vashem] that the experience of the Holocaust places a very special responsibility on all of us," Netanyahu said. "Francois, I want to tell you the burden it places on me. It is my duty to prevent anyone who credibly threatens to execute another Holocaust against the Jewish people. This is my obligation, but our common obligation for mankind and for our common future." Hollande, who upon landing in Israel said that France would not surrender to nuclear proliferation and that Paris would stand firm by its demands on the Iranians before consenting to an interim agreement, spelled out at the press conference at the Prime Minister's residence what those conditions were. Hollande said France was demanding that all Iran's nuclear installations be placed under international controls, the suspension of all uranium enrichment to 20 percent, the reduction of existing stockpiles of enriched uranium, and complete halt to the construction of the heavy water reactor at Arak. "These are four points fundamental for an agreement to be reaches," he said. Hollande said firm guarantees that Iran had abandoned its nuclear weapons program were necessary. "We want a serious, significant agreement that will give results," the French president said, adding that the sanctions pressure needed to continued, and that it was the sanctions that have moved the Iranians at all. Netanyahu said that from his point-of-view, a good agreement was one that dismantled Iran's ability to prepare fissile material, which is the core material of a bomb. Though reiterating his opposition to interim agreements – like the one that is now being discussed with Iran by the P5+1 – Netanyahu said he could live with it if it was within the framework of an agreement that would dismantle Iran's capabilities. Unfortunately, he said, that was not currently on the table, and what was being discussed now was a deal that would allow Iran to keep in place capabilities that would enable it to create enough fissile material for a bomb within "26 days." While Iran dominated Netanyahu's talks with Hollande, as well as the public statements made during the French President's first day in Israel, Hollanade did say on a number of occasions that France backed the current negotiations between Israel and the Palestinians, and that both sides were going to need to make gestures to one another. Asked about the settlement issue, he said that they make it less likely to reach an agreement, and that he was pleased that Israel backed away last week from an announcement of preliminary plans for more than 20,000 units over the Green Line. Hollande is expected to address the Palestinian issue more on Monday, during his meeting in Ramallah with the Palestinians leadership. He is scheduled to address the Knesset after going to Ramallah, and then will be President Shimon Peres's guest at a state dinner. Following his arrival at the head of a massive delegation, that included seven ministers, and some 200 businessmen, aides and journalists, Hollande was welcomed officially by Peres at Beit Hanasi, and then laid a wreath at Theodor Herzl's grave, visited Yitzhak Rabin's grave, and went to Yad Vashem before meeting Netanyahu for a private meeting, followed by a dinner meeting. Though French foreign Minister Laurent Fabius accompanied Hollande, he left suddenly when it was learned that French hostage Francois Collomp had freed himself from captivity in Nigeria. Fabius left Israel for Nigeria to receive him. Hollande will be the first of three major world statesmen Netanyahu will meet this week. On Wednesday he will travel to Moscow to meet Russian President Vladimir Putin, the same day negotiators from the P5+1 and Iran will again be meeting in Geneva for talks, and on Friday US Secretary of State John Kerry is scheduled to arrive here for additional talks. Netanyahu admitted Sunday to differences on Iran with the US, telling the cabinet that there can be disagreements even between the best of friends, "especially when it comes to our future and our fate." Netanyahu told the cabinet at its weekly meeting Sunday that it was his responsibility of Israel's prime minster to look out for the vital interests of the country when faced "with a bad agreement. I hope that we will be able to convince our friends to put forward much better agreement, and that is possible." Netanyahu said the Iranians are under severe economic pressure, and a continuation of that pressure could lead to a better result. "I believe that many in the region, and outside of it, agree with this," he said. Differences between the US and Israel both over Iran and the Palestinian issue came to the fore during Kerry's last visit here some two weeks ago. Netanyahu said Kerry is coming here to push forward the negotiations with the Palestinians, but that the talks will also focus on the Iranian negotiations. Amid a public strain between Jerusalem and Washington, Netanyahu stressed that Kerry "is an old friend of mine, and he is also a friend of Israel."